Playoff Time! Incorporate some health in your game day planning! Yakima, WA – Going into this weekend there will be some great Playoff Football starting! A couple weeks of playoff’s and then we’re getting ready for that Super Bowl. Here at Borton Fruit, we know most people have just started their New Year Resolutions and the typical snack planning for these types of gatherings can really get you off track. Always remember to incorporate fruits and veggies into these occasions to help with that! You’d be surprised how creative you can be while adding that bite of health in with your dish. There are plenty of fruits and veggies out there that we can come up with fun dishes for. Borton would like to provide you with some ideas using apples! Apples are always affordable and when kept in the refrigerator, have a longer shelf life than other fresh fruits and veggies. 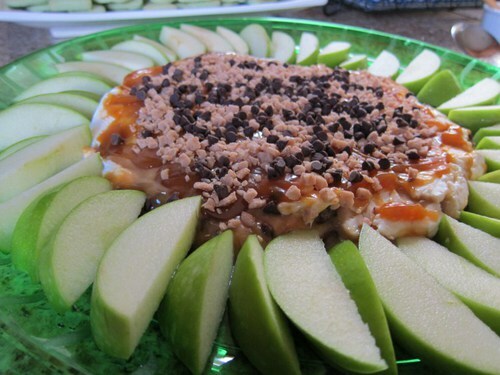 Here are some fun idea’s incorporating Apples into your snack planning. Always remember, you can tailor these to your liking! Eliminate the chips by making APPLE NACHOS!!! Yum! This is so easy! You can do whatever you’d like on these. 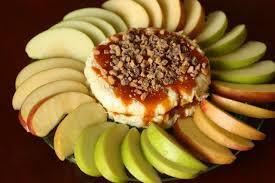 There are a couple images below showing some made with all different kinds of apple varieties and toppings. If you love peanut butter on your apples, heat it up a little bit, then drizzle over the top of the already cut apples. Add any additional toppings you like; almonds, pecans, chocolate chunks, oats, etc. Or you could do more of a caramel theme and use caramel as your main topper and go from there! You can even melt your favorite candy bar’s to put over the top if you want to make this your sweet dish. Eliminate Chips & Bread for dipping and use APPLES! This is a little easier than the nachos. 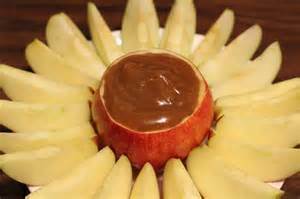 You can make any dip you’d like and put it in the middle of your tray, surround with cut apples and you are ready to go! You can even put that dip right into a hallowed apple to enjoy! 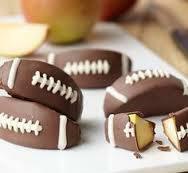 Football Apple Slices! If you are into Fondue, here is a really fun idea! 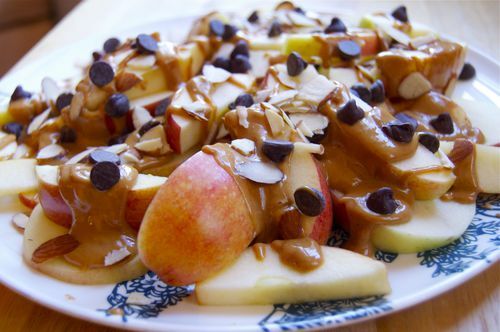 Slice your apples and then dip in chocolate. Find your favorite frosting and put football lines on rounded side of the apple. Or, slice your apples and cut a little of the inner flesh out of the slices. Add some peanut butter and the lines on top of that! 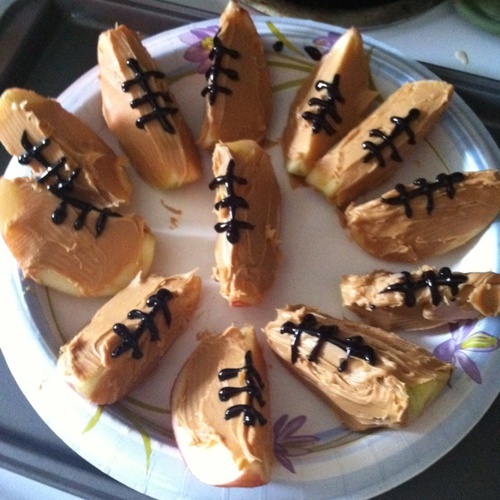 Create your own football platter! How creative is this! 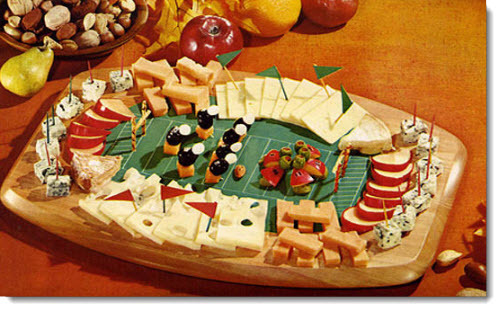 Make your own little football field using your favorite snack items. Apples, Cheese, nuts, veggies, and anything else you’d like! 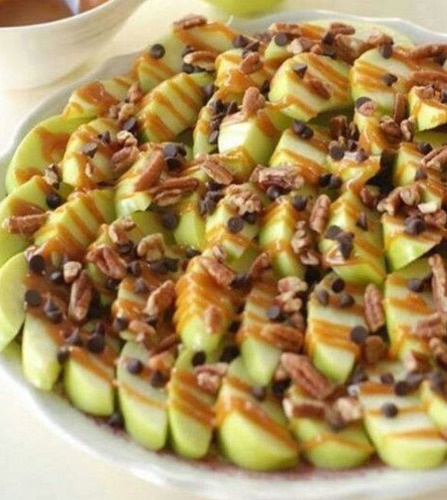 As you can see, there are many ways to incorporate Apples into your Game Day Snack Planning! Get your creative juices flowing and make a “healthier dish”. You can find other fun, easy recipes on our website at http://www.bortonfruit.com/fruit/recipes.html. For more recipe ideas utilizing all fruits and vegetables, please see link to Produce for Better Health Foundation site; http://www.fruitsandveggiesmorematters.org/main-recipes.